Check out the songs posted at my MySpace page. Here's the "Harry Potter" Remix for free. Guante & Big Cats! featuring Chantz. We also have a track called "Greed" on the free Midwest Broadcast mixtape. Listen to and buy the Guante & Big Cats EP "Start a Fire" at the Guante & Big Cats bandcamp page. Listen to and buy RETURN TO EL GUANTE'S HAUNTED STUDIO APARTMENT at the Guante & See More Perspective BandCamp page. Download my mixtape, "Conscious Is Not Enough." Click here for a DIRECT download. It's got about twenty tracks of hip hop, spoken word, jacked beats, original music and more. Check me out on YouTube. 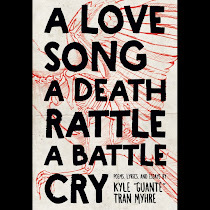 If you just search "Guante" or "El Guante," a bunch of random stuff-- poems, live performances, more-- will pop up. If you would like to buy my old CD, go to my BandCamp page. Alternatively, you can search for me on ITunes or go to CD Baby.